Growing up, I expected to fall in love with many things: girls, seven-inch vinyl records, the coastal town of Brighton, Radiohead and New Balance trainers. I never expected to fall in love with Madeira. That was not in the script. My love affair began whilst holidaying on the namesake Atlantic volcanic island in 2003, at Blandy’s Lodge in Funchal, where in a pique of curiosity I ordered a 1927 Bual. I divide my life pre and post-sip. Like so many misguided people up until that point, I had viewed Madeira with ignorant and unjust disdain – to wit, the tipple granny used to swig after Christmas lunch. Madeira was for fuddy-duddies. Afterwards I understood why those with good taste revere this profound, time-buckling, ethereal and enigmatic wine. Madeira is so unfashionable it is the epitome of cool. I have been fortunate to taste many bottles from what is commonly held up as Madeira’s golden age – the 19th century. They rank amongst the most memorable wines to have ever passed my lips. Though it is easy to look back to Madeira’s halcyon days of popularity, especially in England and the Eastern Seaboard, it is just as important if not more so, to see what is happening today. It would be exaggerating to describe Madeira as undergoing a revolution. It has not suddenly come back into vogue like artisan gin or even sherry. However, I do feel that Madeira is finally receiving credit for the joys it brings and the heights it can achieve. My intention is, over time, to pen more comprehensive articles and build up the Vinous database with Madeira reviews. 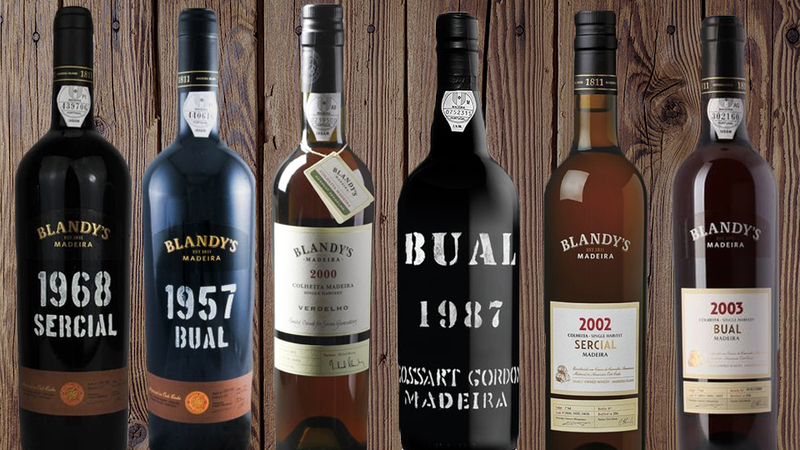 I will not go overboard for this first article, but I wanted to update readers on recent releases from Blandy’s and Cossart Gordon, who together with Leacock’s, operate under the “Madeira Wine Company” umbrella with Chris Blandy at the helm. These recent releases are bottled to be consumed upon release, but the very nature of Madeira means that they will easily give an estimated 15 to 20 years’ drinking pleasure. The drinking windows reflect this view, but they may well last much longer. Blandy’s 1968 Sercial (Bottled 2017) has a potent, oxidative nose replete with scents of grilled walnut, smoke, dried orange peel and faint nougat aromas mucking about in the background. The palate is well balanced with a sharp line of acidity. It is not an overly complex Sercial, leaning towards the richer side of the category. It fans out nicely towards the finish with clove, Chinese 5-spice and marmalade notes. What it lacks in nuance this Bual compensates for with delineation and focus. 91/Drink: 2018-2038. The 1957 Bual (Bottled 2017) has a strict and linear bouquet for this category with scents of clove and hazelnut; an antique mahogany bureau and slightly higher VA than other Buals of similar age. The palate has a pleasant freshness and weight in the mouth with notes of candied orange peel, white pepper, fennel, cloves and just enough VA to lend a nice residual warmth in the mouth. It constitutes a more approachable Bual than others that I have encountered. The 1957 does not assert heaviness in the mouth and yet ninety seconds later I can still feel those lovely Christmas cake and spice notes lingering in the mouth. 93/Drink: 2018-2038. The 2000 Verdelho Single Harvest Colheita (Bottled 2017) sports quite deep burnished golden in color, offering Manuka honey, marmalade and quince scents on the nose; much richer than I was expecting. It becomes a little spirituous with aeration, but nothing to get worried about. The palate is viscous on the entry, smooth in texture with lovely honey, quince, cardamom, ginger and bitter orange. This is packed with flavor, harmonious and almost unctuous on the finish. 90/Drink: 2018-2038. The 1987 Bual from Cossart Gordon (Bottled 2016) had a burnished amber color, perhaps a little deeper than I was expecting given its age. It has a reasonably complex bouquet with marmalade, molasses, toffee apple and a subtle seawater scent. The palate is clean and fresh, nimble for a Bual thanks to the fine line of acidity. I actually discerned more complexity in the mouth than on the nose as flavors of walnut, Chinese 5-spice, smoke and marmalade lead the way on the focused and sustained finish. Leaving the bottle aside for 24 hours, I did notice some improvement in the nose, which my score reflects. 91/Drink: 2018-2038. The 2002 Sercial from Blandy’s (Bottled 2016) has a lifted quince and marmalade scented bouquet that did not quite convey the same delineation as the 2003 Bual. The palate is sharp and fresh on the entry. This is quite a bitter, edgy Sercial but I mean that in a positive way. There is an almost Amontillado-inspired tincture on the finish that lends this real character. You can just manage sipping this with some grilled almonds before, not after a dinner. 90/Drink: 2018-2038. The 2003 Bual from Blandy’s (bottled in 2016) has a relatively light color for a Bual. The nose is fragrant and perfumed with scents of quince, wood varnish and tangerine, well defined and gaining intensity with aeration. The palate is clean and fresh, quite nutty and spicy on the entry with walnut, marjoram, quince and tangy Seville orange marmalade. This is an elegant Bual that feels long and tender in the mouth. It comes highly recommended. 93/Drink: 2018-2038. To finish off, just an extra for Vinous readers, I add a note for the 1860 Bual from Blandy’s that was the perfect way to finish a splendid recent dinner in Hong Kong. This is a rare bottle of Madeira since purportedly only three bottles have ever appeared at auction. According to Richard Mayson, it is in fact a blend of various bottlings assembled to celebrate the arrival of John Blandy onto the island. It has fragrant bouquet that is less oxidative than coeval Bual’s that I have encountered over the years, with scents of Seville orange marmalade, quince, smoke and the whiff of an oak-paneled drawing room in a stately home. There was something intoxicating about the bouquet, almost mesmerizing. The palate is sweet, surprisingly candied in style and very smooth in texture, again, less oxidative than presupposed with a viscous, marmalade, honeyed finish that manifest grilled walnut and almond scents with aeration. It is just a glorious Bual that I could have sat and polished off throughout the night! 97/Drink: 2018-2070.